Jerry Boone reports that "Gary Wheeler was a designer for Dan Gurney until the late 1970s or so, when he decided to design his own cars. There were 13 tubs formed and 12 cars completed. 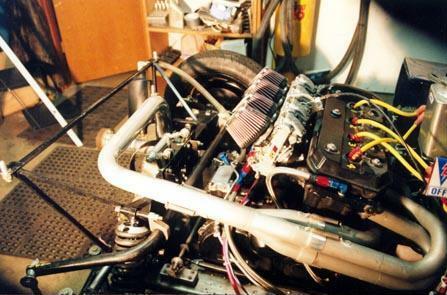 They were built as Formula Super Vees. One was raced by astronaut Pete Conrad, and another by Ted Field. The bodywork is indeed a LeGrand knockoff. But that is where the similarity ends. Underneath it is entirely different. Gary Wheeler, who designed the car, lives in the Seattle area, and still fiddles around with aerodynamic stuff on occasion, doing consulting work with some pretty big name teams." "I think my car was the third one produced. 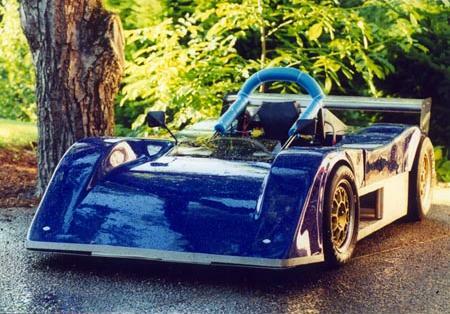 It was raced as a Formula Continental by Terry Annis (sp? ), and went to the Runoffs where I think it did fairly well. 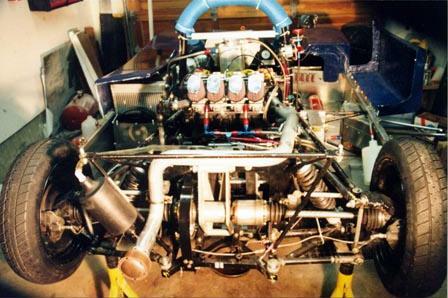 After its life as an FC, it was owned by Mike McDaniels, who raced it in the Pacific Northwest as a sports racer in events with the International Conference of Sports Car Clubs (ICSCC). 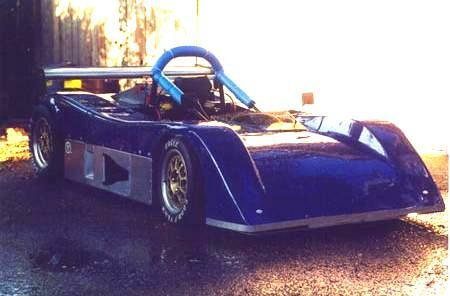 It was powered by a Ford Twin Cam engine (I think a BDA) mated to a Hewland transmission. Mike sold it to his crew chief, who did nothing with it for a few years. 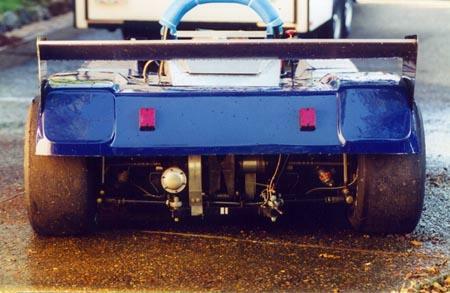 He then trimmed about 16 inches off the rear to shorten the wheelbase to about 84 inches (that's from memory) to fit the DSR bodywork. He never finished the car. I bought my car almost three years ago, and sold my LeGrand 25 to finance its conversion to DSR. It took me about a year to do the work. 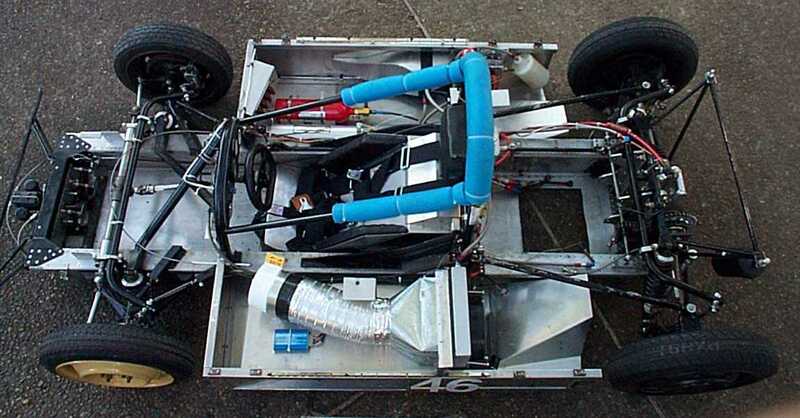 In the last two years, I've turned about 20 laps in it...done all sorts of R&D to solve overheating problems (there is a NACA duct in the front now...not seen in these photos...which force feeds a side mounted radiator). I also swapped the tired 1000R for the Kawasaki ZX11 (it hasn't been sleeved down because in ICSCC there is a class for that size engine). Cooling used to be a problem. 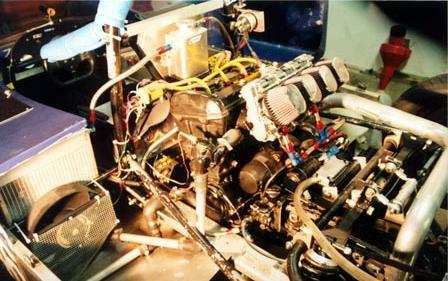 I now duct air directly from the high pressure area in the nose, and force feed it into the radiator. The last time I had it out, on about a 90 degree day in Oregon, it ran cool enough that you could see the temp dial move as the thermostat opened and closed. The tube you see connects with a matching one that attaches to the underside of the nose piece. There is a NACA duct there (it was added after the outside photos were taken). The fan is there for cooling on the cool down laps or if it has to sit in the pits. I could probably do without it, but I figured it was cheap and fairly lightweight insurance. Our noise rules are 103 dB at 50 feet. I'm not sure what other areas have to meet, but at Portland the exhaust noise has not been a problem. When I had the exhaust system built, I had it cross over the rear of the car just in case I needed to put an additional muffler on. So far that hasn't been necessary. The header primaries are 1.5" diameter, and total 30" from the flange face to the merge point of the collector. The collector ends in a 2" diameter pipe. It is 50" from the point where the 2" pipe merges with the four primaries, to the back of the Supertrapp. We stepped up the secondary pipe at the end, beginning with the 2" pipe, going to about two inches of 2.25" pipe, and ending with a 2.5" diameter Supertrapp. In other words, the system is 80" long, with 30" of that being 1.5" primary pipes, and the rest being 2" secondary."